Many of the Tuesdays with Dorie recipes from Baking with Julia have been new to me, either in ingredients, technique, or finished product. Not so these hearty whole wheat loaves. I’ve been baking bread for over 30 years, so there was nothing new here. Classic ingredients, standard techniques, nothing fancy. But don’t take that to mean this was a ho-hum recipe. Far from it. While everything about this recipe was comfortably familiar to me, the finished loaves were nothing like the dense, crumbly whole wheat loaves so many recipes produce. No, these were light, airy, slightly sweet loaves that rose well over the pan and far beyond my expectations. The ingredients list for the loaves was simple: water, yeast, honey, bread and whole wheat flours, canola oil, malt extract, and salt. It’s the honey and malt that give these loaves their earthy sweetness. And the combination of flours resulted in a hearty, yet tender, crumb. 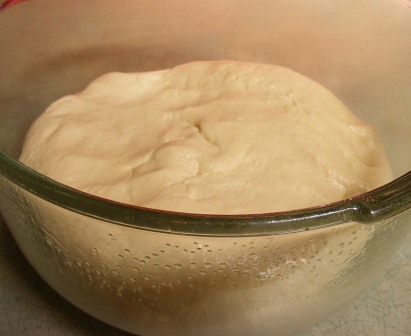 The dough was wonderful to work with: firm, tacky but not sticky, and quite supple. 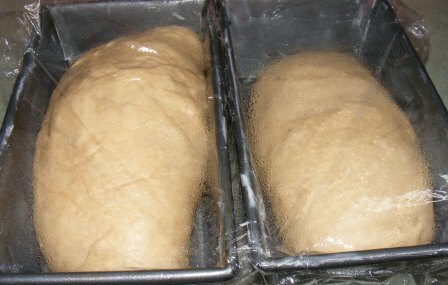 I divided the dough (not too evenly, as it turns out), shaped the loaves, and put them in pans to proof. After an hour of proofing, the loaves were well-risen and ready to bake. This, boys and girls, is why you should always scale your dough. I baked the loaves, cooled them, then put one in the freezer and kept the other out to use for toast and sandwiches. 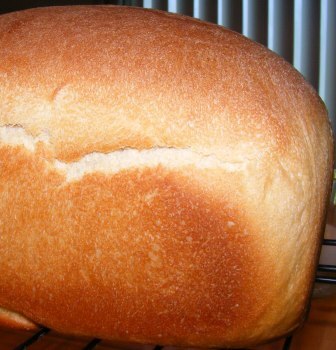 This is a delicious bread, and easy enough to make a bread baker out of anyone! Our host for this week are Michele of Veggie Num Nums and Teresa of The Family That Bakes Together. 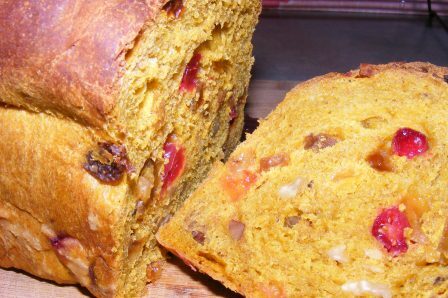 Check out their posts for the recipe and to see what they thought of this bread. The first July recipe for Tuesdays with Dorie — Baking with Julia is one of my favorites: biscotti. I’ve made, and eaten, a lot of biscotti. There’s just something about dunking a crunchy biscuit into a steaming cup of coffee. 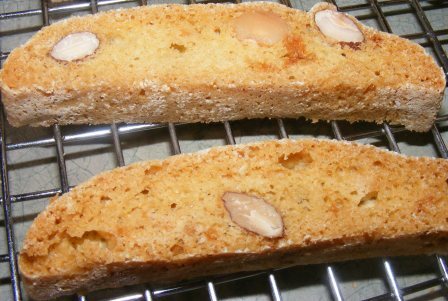 I used to think biscotti must be difficult to make, but they are actually quite simple. You mix up a quick dough, press it into a log shape on a pan, bake it, slice it, and bake again to crisp them up. 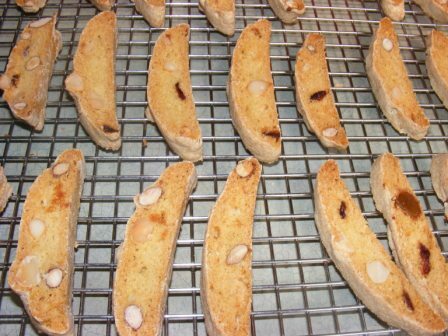 Since I discovered how simple they are to make, I’ve made many different biscotti, including several original biscotti recipes. 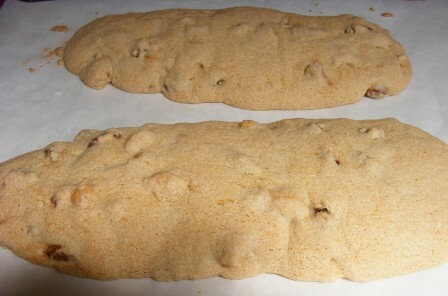 So, I was really happy about this month’s first recipe — Hazelnut Biscotti. I decided to make the biscotti on a lazy Sunday afternoon, and I didn’t feel like running to the store. I didn’t have any hazelnuts, so I decided to use a snack mix from Trader Joe’s with macadamia nuts, almonds, dried cranberries, and candied ginger. 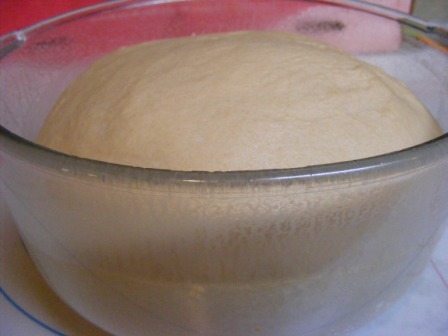 The first thing I noticed about this recipe was how wet the dough was. 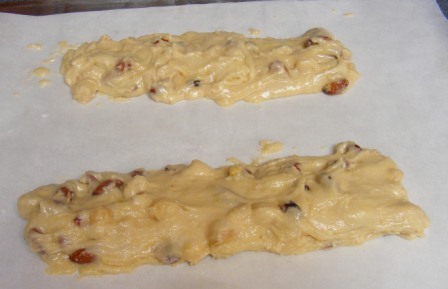 Biscotti dough is usually the consistency of biscuit or cookie dough — soft, but mailable, and easy to shape. The recipe said the dough would be stiff and sticky, but it was downright gloppy. I had a heck of a time shaping the dough into logs on the baking tray. I knew it would bake up OK, but it was really an unpleasant dough to work with. It wasn’t pretty after the first bake, but I knew it would slice up fine. I let the logs cool, then sliced them into individual biscotti. I put the slices on a cooling rack, which I put in the oven to crisp up the biscotti. 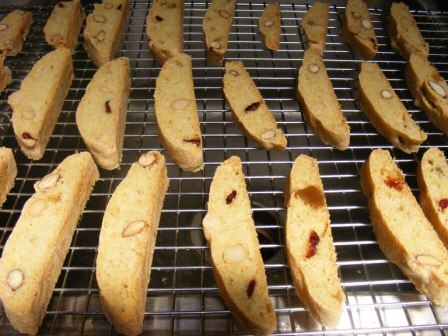 I liked the idea of baking the biscotti on a rack so the heat can circulate evenly around them to crisp them up. The best part about these biscotti was the Trader Joe’s snack mix. The nuts, cranberries, and candied ginger gave the biscotti the only discernible flavor. Otherwise, they were quite bland. Between the unworkably wet dough and the lack of flavor in the finished biscotti, this recipe is definetly not one that I will make again. Our hosts this week are Jodi of Homemade and Wholesome and Katrina of Baking and Boys. 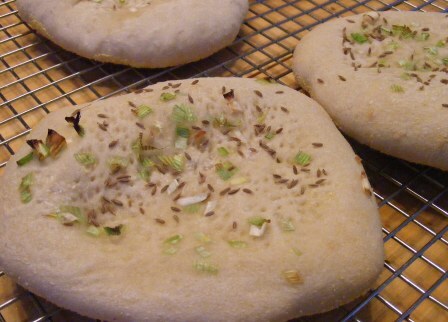 The first June recipe for Tuesdays with Dorie is Oasis Naan. I was lucky enough to be picked to host this recipe, so I’ll be posting the full recipe with step-by-step photos and instructions next week. The Oasis Naan begins with a batch of Persian Naan dough, and since I had to make the dough anyway, I decided to make some Persian and some Oasis Naan. 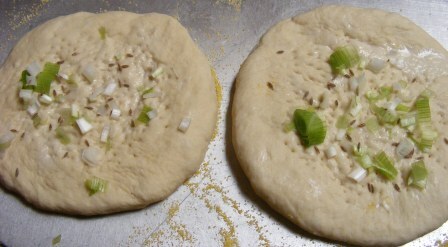 Check out the Oasis Naan post for the recipe and instructions for making the dough. 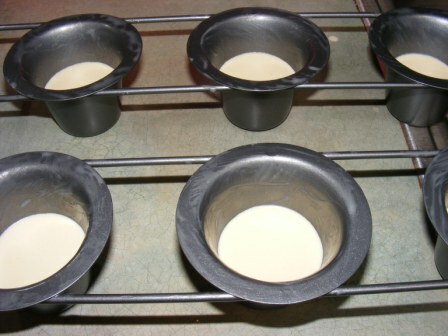 After mixing the dough and letting it rise, I got my oven ready. 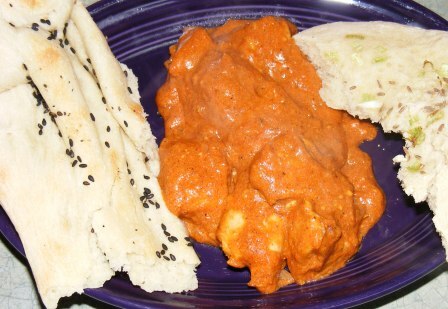 Naan is traditionally baked in a clay oven called a “tandoor”. 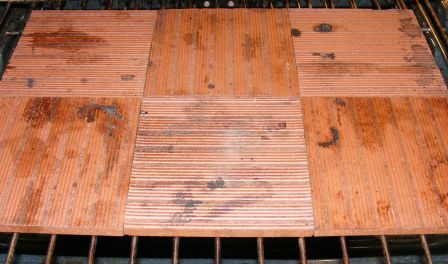 The best way to replicate this in a home oven is with a baking stone or clay tiles. I picked up these unglazed clay tiles for about 50 cents each at a French bread baking class I took a few years ago. 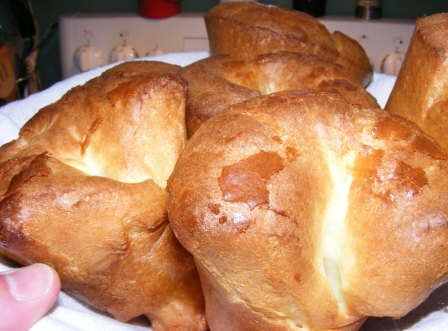 They are great for baking crusty artisan breads. And because they are individual tiles, they are easy to get in and out of the oven, store, and (if you buy extras like I did) replace if you break one. I set the oven to 500°F and let it preheat while I shaped the naan. 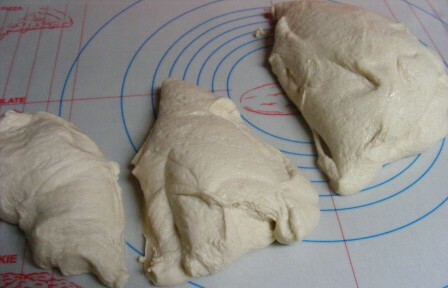 I deflated the dough and divided it into four pieces. I preshaped each piece into an oval, then let them rest while the oven finished preheating. This allowed the gluten to relax and made them easier to shape. In the meantime, I prepared a small bowl of water and got out some black sesame seeds. Once the dough had relaxed a bit and the oven was good and hot, I began shaping the naan. I made one at a time. 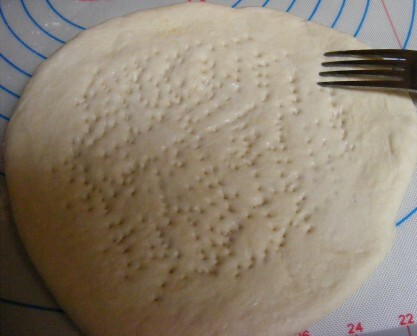 First, I pressed the dough out with wet fingertips. 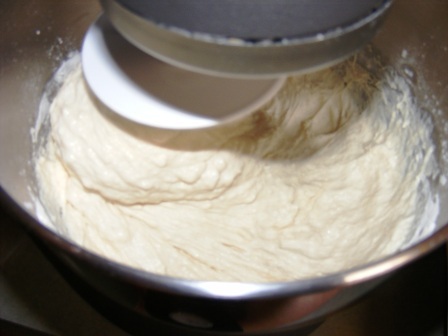 I dipped my hands in water every few seconds to get the dough good and wet. 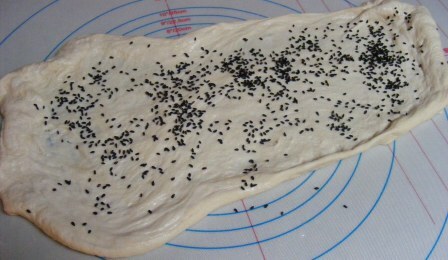 Next, I gently lifted the dough over my hands and stretched it out. 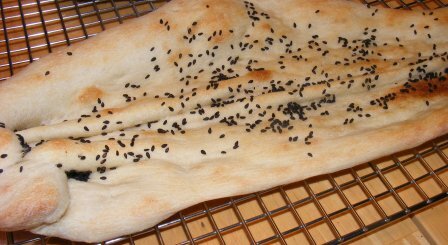 Finally, I sprinkled the naan liberally with black sesame seeds. I lifted the naan off the work surface and gently moved it to the oven. It only took about five minutes to bake, since the oven and tiles were so hot. As you can see, my naan came out kind of funny shaped. I had stretched it too long and had to make it fit on the tiles. Hence, the shmoo-shaped naan. This was fine, as naan is a rustic bread that is served by placing the whole piece in the center of the table and letting everyone tear off hunks to eat. The naan was delicious. Light, crisp, and just a little bit yeasty. The thinner parts were almost like a cracker, while the thicker sections were soft and pillowy. 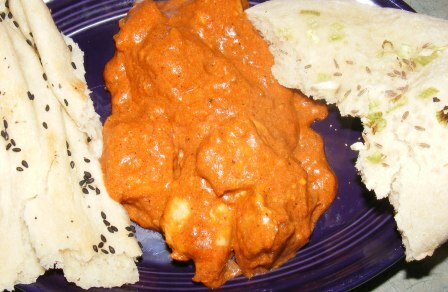 I served the Persian naan with butter chicken for a delicious and satisfying dinner. This recipe was fun to make and wonderful to eat. Definitely a repeat. 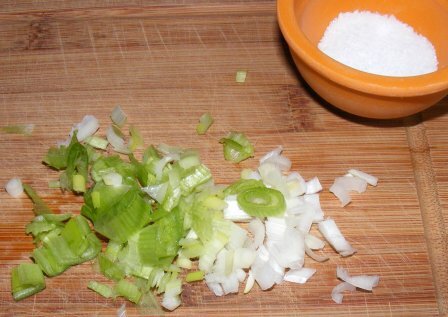 Our second May recipe for Tuesdays with Dorie is one with which I am very familiar. Growing up in Lancaster County, Pennsylvania, sticky buns were an almost ubiquitous morning treat. After leaving PA Dutch country, I tried so-called sticky buns literally from coast to coast. None of them could hold a candle to any that I had growing up. 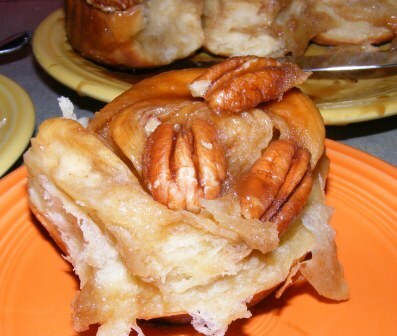 And of the sticky buns in Lancaster County, none could compare to the ones made by Melinda Fisher. I was close friends with the Fisher boys growing up — John, Jake, and David — and was lucky enough to spend many nights at their house. Dan and Melinda grew up Amish, and although they no longer lived on a farm, they still breakfasted like farmers. So breakfast at their house was always a treat. But never more so than when Melinda made sticky buns. I’m not sure what made her sticky buns so much better than all others. Dan raised bees, so she naturally used honey in her recipe. But it was more than that. And I wish I had her recipe. They were, as the Dutch would say, am beschde (the best). So, when Dorie claims that Nancy Silverton’s recipe is the ne plus ultra of sticky buns, she has a high bar to clear in my book. This, then, is a battle of superlatives: the ne plus ultra versus am beschde. And as much as I love Melinda’s sticky buns, I was pulling for Nancy’s recipe to come out on top. After all, I have her recipe available to me in my copy of Baking with Julia. Nancy Silverton’s sticky buns recipe begins with a batch of her brioche dough. I made the dough the day before baking the sticky buns, and because it is a completely separate recipe, I gave it its own blog post. 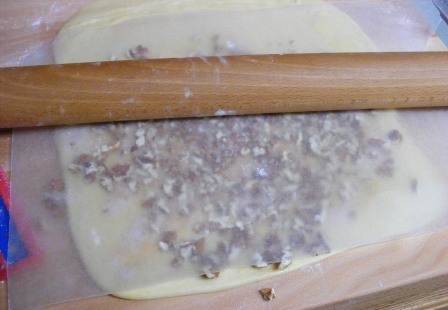 The first step in making the sticky buns (once you’ve made your brioche dough) is laminating the dough. No, this doesn’t mean putting through a machine to encase it in plastic. In this context, laminating refers to folding (or turning) layers of butter into the dough. 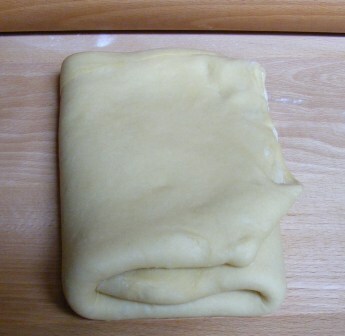 To do this, I divided the dough in half, and rolled one piece out to a large rectangle. 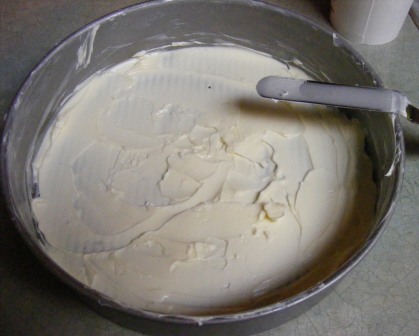 Then I spread softened butter over the dough. When I made the brioche dough, I found it much easier to work with the butter if I spread it with an offset spatula. So even though the sticky buns recipe said to dot the dough with butter, I used my spatula to spread it evenly over the entire surface of the dough. I folded the dough in thirds. letter-style, then rolled it out to roughly the same size it had been before. I folded the dough again, then wrapped it and put it in the fridge while I worked with the other half. 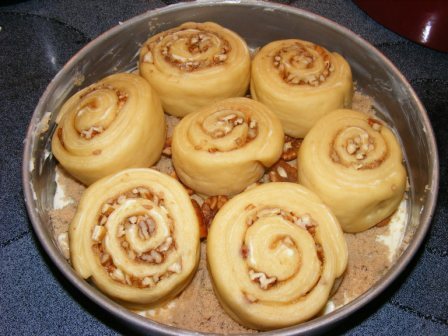 When the dough was chilled, I rolled one piece out again, then brushed it with an egg wash and sprinkled it with cinnamon-sugar and chopped pecans. 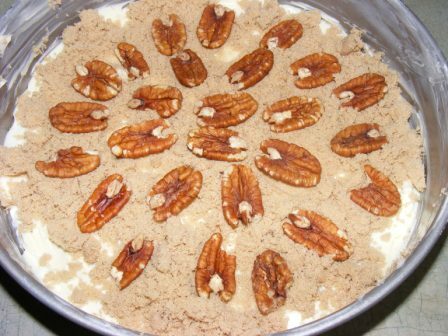 The recipe said to roll the pecans and sugar mixture into the dough with a rolling pin, which just sounded like a mess waiting to happen. So I covered the dough with wax paper before rolling it. That kept my rolling pin clean and ready for the other half of the dough. 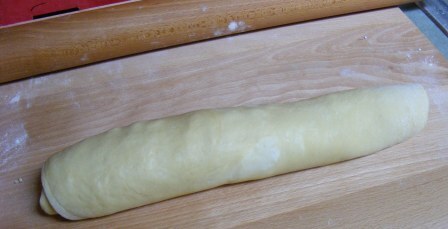 I rolled the dough into a tight log, which I then wrapped in plastic wrap and put in the refrigerator for about an hour. This recipe makes 14 sticky buns, but as there are only four of us, I decided I didn’t want to make all the buns at once. After the initial chill, I double-wrapped one log and put it in the freezer for another day. 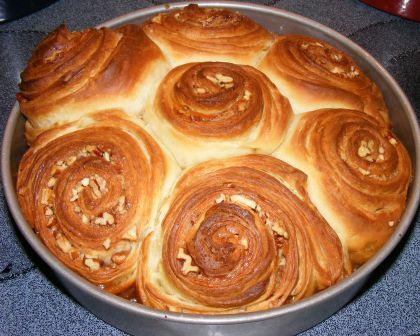 One of the unique things about sticky buns is that they are baked upside down and inverted onto a plate as soon as they come out of the oven. The “sticky” is a caramel sauce in the bottom of the pan that, when inverted, covers the tops of the buns and oozes down the sides, covering the entire sticky bun with ooey-gooey goodness. 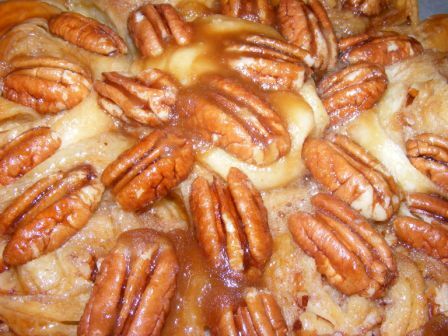 Most recipes for sticky buns that I’ve seen use a caramel sauce that is cooked and then poured into the bottom of the pan. This recipe, however, makes the caramel sauce directly in the pan while the buns are baking. 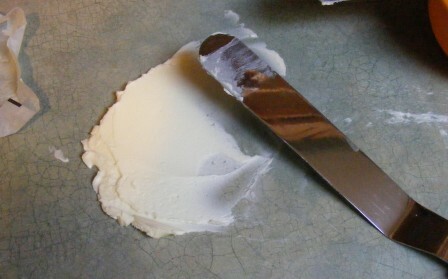 To do this, you use your fingers to smear a stick of butter on the bottom of the pan (at the risk of sounding like a broken record, I found this much easier to do with an offset spatula). Then you top the butter with brown sugar. In my final major departure from the recipe, I arranged pecans on top of the brown sugar. 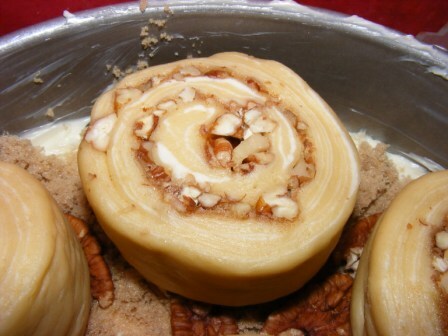 The recipe says to press the pecans into the top of the buns, then try to hold them in place while you invert the buns into the pan. Why not just put the pecans in the pan to begin with? To form the buns, I cut the dough into even-sized pieces (yes, I measured them). I flattened each roll slightly, then arranged them in the pan. 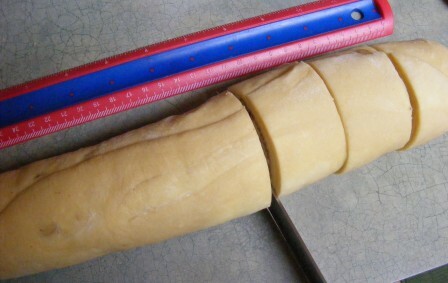 Looking at the formed rolls, I saw the results of laminating the dough. 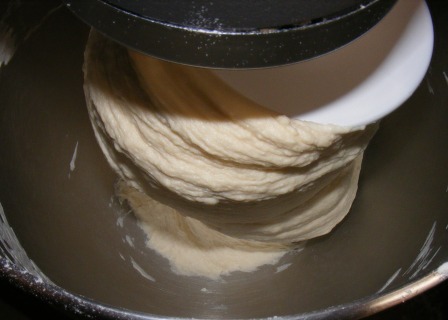 I set the rolls aside to rise, which I knew would take a few hours, as the dough was still quite cold. After about two hours, the rolls had risen and were touching, so it was time to bake them. I baked the sticky buns at 350°F for about 40 minutes, until they were well-risen and golden brown. As soon as they came out of the oven, I inverted the sticky buns onto a plate. They were beautifully layered, and the caramel flowed over and around them as if on cue. I waited for the buns to cool a bit (no sense scorching myself with hot caramel after all that work), then dug into them. The sticky buns were rich, buttery, and pull-apart flaky. The caramel was sweet and creamy, and the pecans gave the buns a nice crunch. As far as the flavor goes, both the buns and caramel were a bit flat and tasted like they needed some salt. And the buns overall were just so-so. Better than many I have eaten around the country. But not as good as the ones I used to get in PA. And nothing like Melinda Fisher’s. I had such high hopes for these sticky buns, especially since they used an insane amount of butter and were two days in the making. Unfortunately, they didn’t live up to the hype. 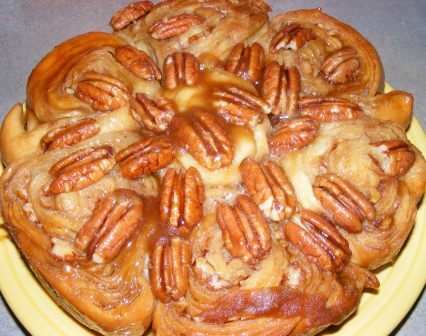 And while I will continue to search for a sticky buns recipe that can live up to the ones made by Melinda Fisher, I definitely won’t be making this recipe again. 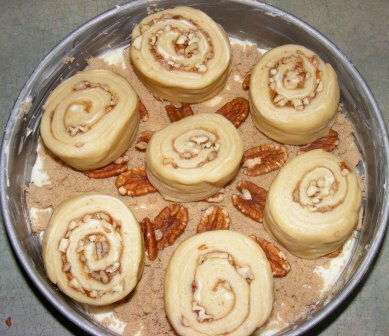 Our next Tuesdays with Dorie recipe is Pecan Sticky Buns, which is due to be posted May 15, 2012. 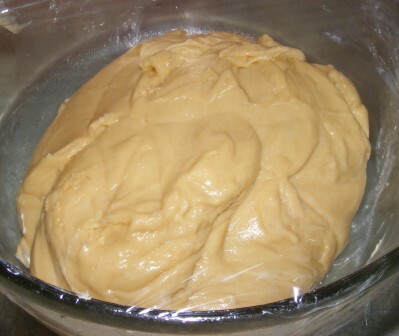 The first “ingredient” listed in the recipe is one batch of brioche dough. Since the brioche is a separate recipe and is used as a base for various other recipes in Baking with Julia, I decided it deserved its own post. Brioche dough is loaded with butter and eggs, so you know whatever you make with it is going to be good. Brioche is known for its richness and fine texture. 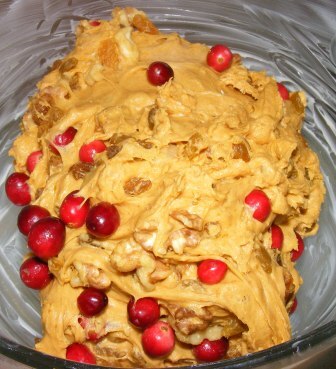 It can be tricky to work with, and it is definitely best made using a heavy-duty stand mixer. Now, I’m no stranger to brioche. I made three versions of it during the Bread Baker’s Apprentice Challenge. 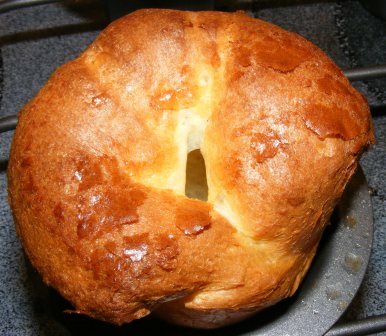 Bubble-top brioche was one of the first recipes I made from Dorie Greenspan’s Around My French Table (AMFT). And Nick Malgieri has a quick and easy brioche recipe in The Modern Baker, which I used to make a quick brioche braid and marbled chocolate brioche loaf. The recipe in BWJ was contributed by Nancy Silverton and begins with a sponge. 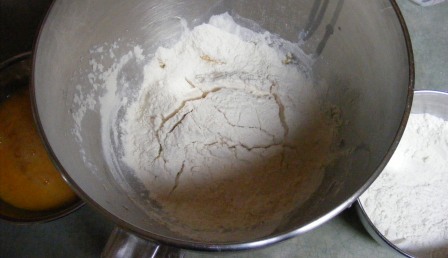 Milk, yeast, one egg, and a bit of flour are mixed just until the flour is blended in. 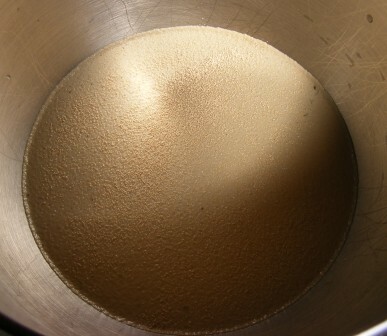 More flour is sprinkled on top, and the sponge is allowed to rest until the yeast begins working. You know it’s ready when the flour starts to crack. Once the sponge was ready, I added sugar, salt (not enough, in my opinion; next time I’ll increase the salt by about half), and more eggs and flour. I mixed the dough in my Kitchen Aid mixer with the dough hook for about 15 minutes, until I had a shaggy dough that clung to the dough hook and slapped against the side of the bowl. 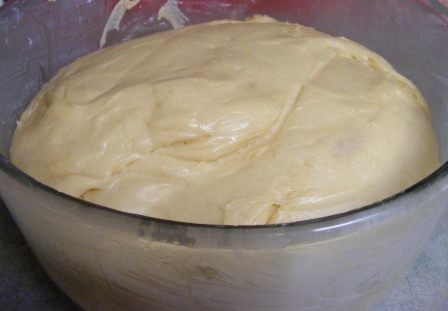 The next step called for incorporating lots of butter into the dough. In order to do this, the directions said the butter should be roughly the same texture and consistency as the dough. 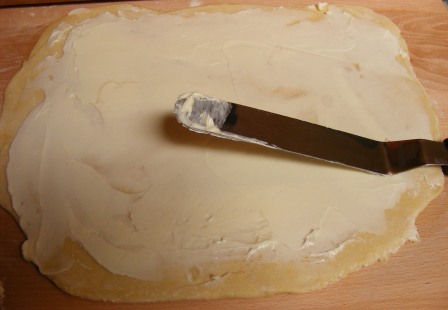 The recipe recommended beating the butter with a rolling pin or smearing it on the work surface with a dough scraper. I decided to use the smear method, but I found the dough scraper awkward to work with. I had much better luck with an offset spatula. I incorporated the butter a bit at a time. 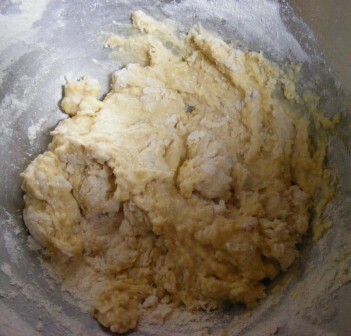 Thanks to the instructions, I didn’t worry when the dough separated, as I knew with continued mixing it would come back together. 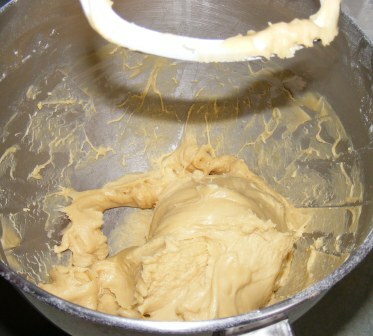 Once all the butter had been added, I continued to mix the dough for about 5 more minutes. 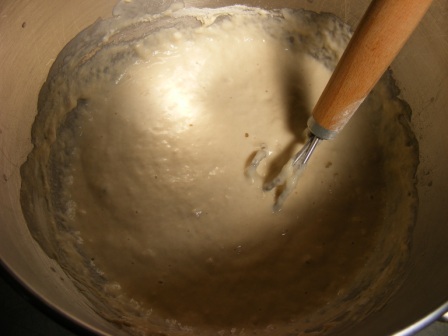 The dough was soft, sticky, and warm from all the mixing. I put it into a large buttered bowl and set it aside to rise. 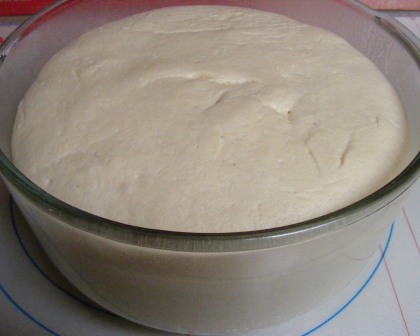 After about 2 hours, the dough had doubled in size. 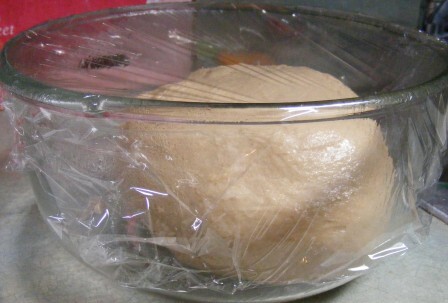 I deflated the dough and put it in the fridge for its second rise. 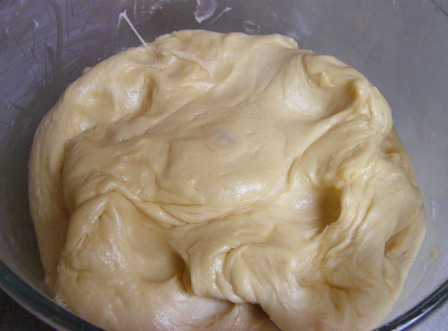 After an overnight rest in the refrigerator, the dough was ready to be made into sticky buns. Check out the sticky buns post to see how they came out. As for the brioche dough itself, I would have to say it was my least favorite of all the variations I’ve tried. It was extremely labor intensive, and the final product didn’t have a payoff in line with the amount of work involved. I suspect Dorie wouldn’t be too surprised to hear this. 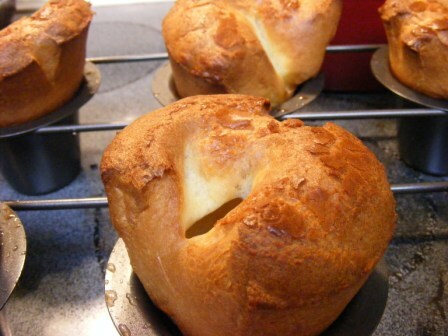 After all, she developed a much easier and more straightforward recipe for brioche for AMFT.